When I was in middle school, I think I wore a headband every day. It’s the female equivalent of putting a baseball cap on to hide your messy hair (not that I never do that, either). 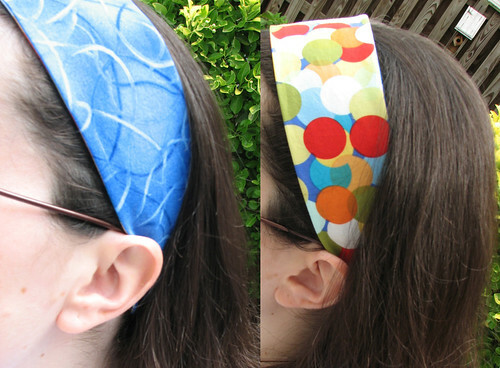 Apparently headbands are back in fashion and I have been coveting some trendy, fabric headbands. I worked out a method for making them and they fit nice and look even nicer, so I thought I’d throw up a tutorial so all the citizens of the internet could make them as well! 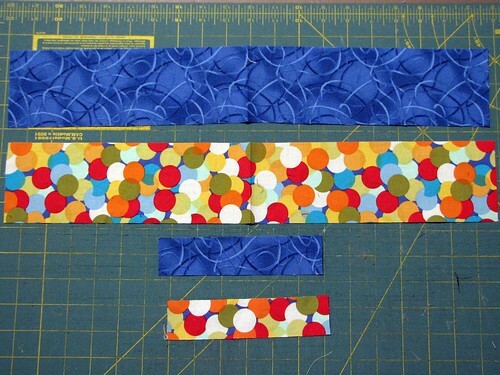 Choose two coordinating fabrics and cut out two rectangles from each. One 3″ x 19.5″ and one 1.5″ x 6.5″. 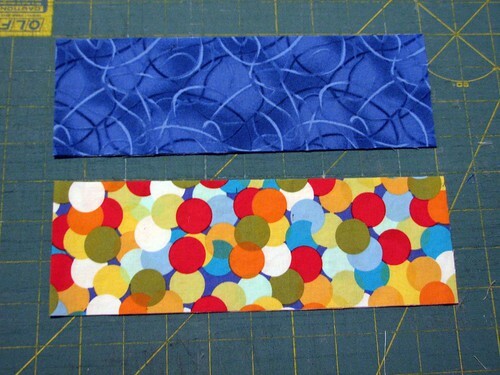 Now, open up each band and press 1/4″ on each end of the wrong side of both fabrics. Place the fabric bands right sides together and pin. Do the same with the smaller rectangles you cut earlier. 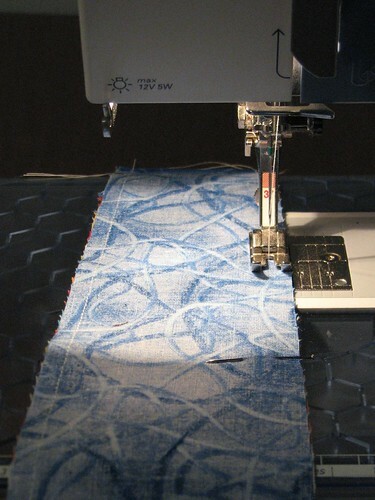 Sew 1/4″ seams on each side. If you have pinking shears, use them to reduce the bulk by pinking the edges. 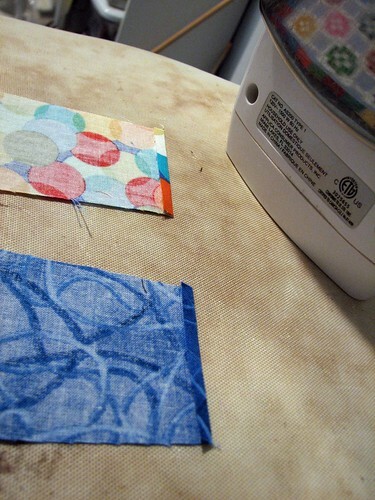 Press seams and turn fabric tubes inside out. Press Again. 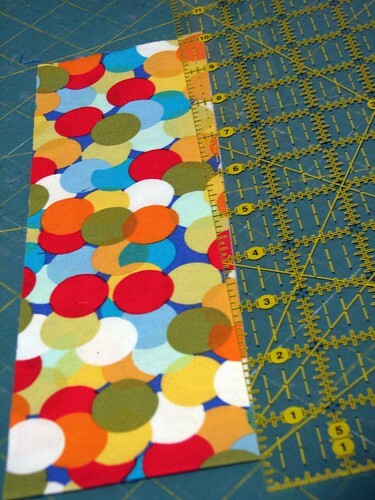 Cut a 3″ strip of elastic and insert it into the small rectangle. 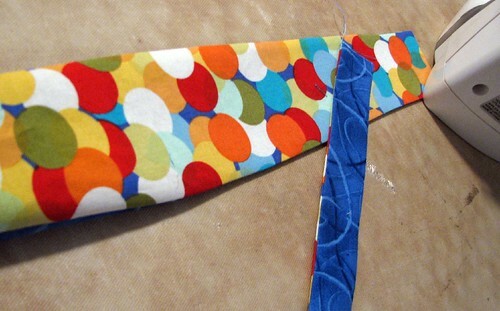 Pull one edge to the outside of the rectangle and slip the whole thing into one side of the headband tube. 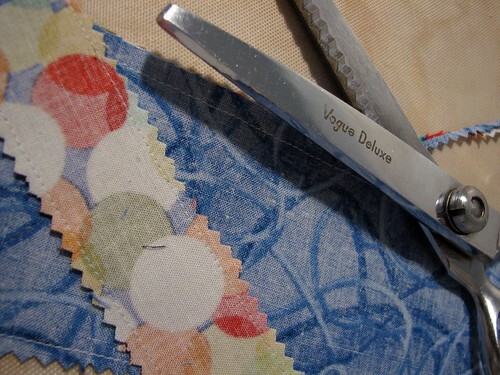 Sew a seam as close to the edge as possible. Scrunch the other side of the fabric rectangle up until the elastic peeks out of the edge. 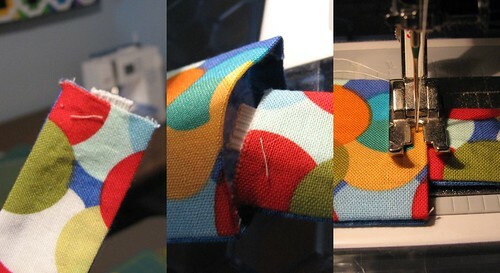 Once again, slip it into one side of the headband tube and sew a seam as close to the edge as possible. When I saw that the Whiplash category this month was Hats I assumed that I would not be submitting an entry. After all, I do not crochet or knit. However, I decided to take some liberties and interpret “hat” as “anything you wear on your head”. Therefore, this is my entry for September as a tutorial. I don’t expect to win, given the stretch, but hopefully I can help some people make some nice things. I know I’m always looking for new ideas for crafted gifts and this seems like an ideal one. Great instructions and pictures! Your project looks so neat, both in the tidily done and keano meanings. So cute!And you did a wonderful job on your tutorial.I can’t wait to give it a go. well rest assured you will have helped at least one person make several nice things.Thankyou, it’s very clear, both the instructions and the photos. Thanks so much for the tutorial. I saw some fancy looking headbands (not too different from these) in an accessories shop a few months ago and they were $18 a piece! I knew i could make them, but never got around to figuring out how. now maybe I’ll try it. You have to win. This is a great idea and so simple I think even I can make them. I’ve now found a great gift for two of my nieces. Thanks! What a great design. You get my vote. I use the same elastic technique on the fairy crowns I make, it adds a great finishing touch. Leil wears headbands all the time, can’t wait to make some of these for her. This is fantastic, a real winner! Wonderful tutorial! I especially like all of the pics – very helpful! Great job & good luck! This rocks. What a great tutorial. Love it. I made one of these yesterday and I just wanted to say I love it! Love them! You made the tutorial easy to follow with great pics. I made one today, but could you offer advice how to turn the tubes right-side out when the side seams are sewn? I had a hard time, especially with the smaller one. Thanks so much! This is a FANTASTIC pattern. I just made it with a girl scout troop. 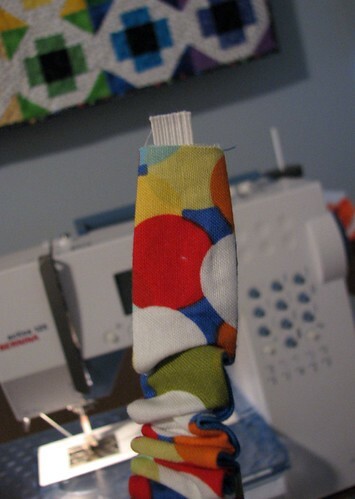 I have some tube hints that don’t require fabric-store gizmos…for the large tube, fold one end inside-out (like you’ve rolled the top of a paper bag) then use the handle end of a wooden spoon (or a tinker toy stick) to push the fabric through and help with the turning. The little tube was too difficult for the girls to turn, so here is an alternative: cut a 4 x 6 inch rectangle in ONE of your fabrics. Fold one of the 6″ sides over a quarter inch and press. Then, fold the fabric lengthwise in thirds, (right side out) putting the side with the folded edge on the top. Stitch as close to the edge as possible. This makes a rectangle you don’t need to turn. Of course, the same fabric will show on both sides of the covered elastic. Most of the time this is tucked under the hair anyway, but it will be even more important for you to choose coordinating fabrics. For the 9-11 year old girls, a rectangle 17″ seemed to work best. Also, they struggled with the “tapering” concept so I think the next time I do this with kids, I will make a pattern template. For the comment about how do you turn it inside out…Use a pen or knitting needle to help push it or use the ‘string thru a sweatshirt trick’ of attaching a safety pin to one end to help turn the material inside out. I just made my first headband, so cute! I used the same material both sides but cut it differently to show the pattern of stripes long and short. This was just what I was looking for… if I knew how to vote my vote would be for you! How wonderful for you to share this! I’ve been searching the Web all afternoon, looking for exactly this sort of headband, and here you’re sharing it for free! Bless you! Just found this tutorial this afternoon and am now wearing my new headband! Yea! I love it! Thanks! thanks for the tutorial. i made up a couple today. Exactly what I was looking for as caps don’t really suit me. You’ve done a great job, and I will be making one today. This sure does a great job showing you how to do it yourself! For those who don’t have the time, I’ve found a great site to buy unique headbands – WomenOfTheCloth.com – their stuff is beautiful, and very high-quality. Nothing compares to handmade, and when you have the time, make ‘em yourself. When you’re short on time, shop there. Theirs are handmade too! Thanks for the fabulous instructions! I love it!! Thank you so much. I’m making this for my grandaughter’s birthday this week; something to match her outfit….you rock! I’ve made several headbands now using your tutorial. Thank you so much !! My daughter is much overjoyed. I have mentioned you on my blog ! THANK YOU ever so much!!! This tutorial is exactly what I need and was surfing the web for. Great pictures and instructions – step by step. Great idea and thank you for sharing your gift with me. THANK YOU! Target is charging $7.99 and up for these, and they are made of really nasty fabric…but these headbands keep coming back in style because they are really really flattering and practical. thanks for taking the time to write all this out and post it. Oh wow!!! AWESOME tutorial!! I googled, ‘how to make an elastic headband’ and found your blog. I’m an average seamstress (at best!) and I whipped two out in one hour. Thank you so much for taking time to make this awesome tutorial!!! Thanks so much. I’ve seen these on Etsy and knew I could sew my own. Your tutorial made it so easy. Thank for the good tutorial. I made 5 nice headbands. Sometime I put on my hat. Wonderful tutorial!!! Thank you so much. Thank you for that great tutorial. I am going to make some of these for my daughters. Thanks sooo much for this tutorial!! This is by far the best one of headbands i’ve ever seen . I’ll try doing it when my mom’s sewing machine returns from the doctor xDDD (that thing is sooo old). Thanks again :p.
p.s: sorry for my bad english (i’m latinamerican). I made 2 of these last night & they turned out great!! Thanks for the SUPER easy to follow tute! Just what I was looking for to tame my not long… shortish… trying to grow it out… unruly mane! Thanks so much! This is wonderful!! A tip for turning the tube inside out that my mom taught me when I was a kid … attach a safe pin on one end and string it through to the other end. Great Tutorial. I think these would make awesome Christmas presents too! Wow! I might even be able to get this done in time for Christmas…thanks for the awesome tutorial! This will be my project tomorrow! Thank you for an easy tutorial for a beautiful headband we all can make! Thank you for the wonderful tutorial! I adjusted the dimensions to make it fit my 3 year old (17.5 x 2.5 inch long straps and 5.5 x 1.25 inch short straps with 2 inches of elastic) and it worked perfectly! Hey! loved the headband. I added your blog to mine, if u dont mind. Thank you for the great headband, I love that it's reversible! I made one and it was so easy and comfortable! I used lightweight denim and a white bandana print. Thank you for this wonderful pattern!! My daughter (10 yrs old) thinks this is the greatest headband! So do I, it is really easy to make. I am making her headbands to match the outfits that I am making her. 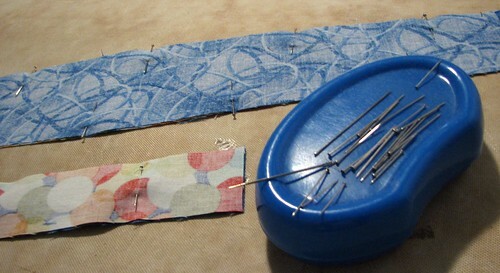 Great tutorial, I am starting to sew and want to give this a go! Thank you so much! I wanted to make a headband for my babysitters "tween" daughter to match a dress I am making and this was the perfect pattern and very helpful tutorial! Thank you so much for this pattern. My daughter had been working in Malawi, teaching nursing for a British voluntary organisation (having sold her house, car etc to do so). She was involved in a very serious car accident and had to be flown out to Nairobi and then back to England. She fractured 5 vertebrae and has been home with us since November. She felt very conscious of the fact that the accident had scarred her scalp and left her with a bald patch. I scoured the internet for a pattern for a headband and found your wonderful instructions. After I made a prototype, Teresa asked me to teach her to use my sewing machine and is now in production herself and is making them to match all her outfits! Thank you so much for this, it has been wonderful therapy. She is making a good recovery and is returning to Malawi at the end of this month – you can imagine how I feel about this! Wonderful tutorial. Thank you very much. I Get to Keep This One! Auntie Booger on I Get to Keep This One! Lil Miss Red T-Shirt on I Get to Keep This One!